In the spring of each year, the questions about waterfowl reproduction start to come in. What follows is my attempt to answer the most frequently asked questions on that topic and to give some advice to beginners about avoiding pitfalls. What do I need to feed my waterfowl when they are laying eggs? You need to feed them a breeder feed, not a layer feed. Layer feeds were designed to maximize the production of eggs destined to be eaten. The nutrients in that feed are not designed to nourish ducklings, goslings, or chicks during incubation. Ideally, the use of breeder rations should begin a few weeks before the first eggs arrive and continue while the birds are producing eggs. They also need calcium for the egg shells. That comes in the form of oyster shell which should be sold at the same place one buys the feed. Do not give the birds oyster shell when they are not producing eggs as it can be harmful to them. A word about protecting your setters from parasites: be sure that each setter is sprayed or dusted with mite/louse insecticide prior to when she begins to set. I prefer not to treat them during incubation but I will if inspection reveals that they are infested. Mites in particular can torment either waterfowl or chicken setters and may drive them to abandon their eggs. My ducks (or geese) are laying eggs in their yard, water pools, etc. Why are they not making a nest? Especially in their first year, ducks and geese may be taken by surprise by the onset of egg production. It may take them a while to figure out that they should be laying their eggs in a nest. Make sure that the birds are furnished with well bedded nest boxes placed in dark corners of their building. Even then they may decide to make their nests elsewhere. Just do not permit them to nest in unsafe areas where predators can get at them. Nest boxes should conform to the size of the bird using them. I use boxes about 12 inches by 12 inches for my East Indies, for example. The front of the box should feature enough of a lip to prevent eggs from rolling out when the bird leaves the nest but not so much that it is an effort for the bird to get over it. Some waterfowl breeders like to place a piece of sod in the box to provide a way to hold moisture, especially if they live in dry parts of the country. My goose (or duck) keeps laying eggs but she seems not to be inclined to set on them. Every female has an internal clock that tells her when she has enough eggs and that it is time to begin incubation. Unfortunately, due to man's intervention, some breeds have been developed to the point where their maternal instincts are very weak or are nonexistent. Breeds such as the China in geese and the Indian Runners and Campbells in the ducks were bred for maximum egg production and the instinct to want to set was systematically bred out. They do, therefore, tend to make poor mothers as a group although there are certainly individual exceptions. On average, older females seem to possess stronger maternal instincts than young ones. It is very important to control how many eggs are under your birds. Do not let them have any more than they can cover completely. Females are always manipulating the eggs under them with their feet. If they have too many eggs and some protrude from under her, they will become chilled and die. Since the female rotates the eggs, sooner or later all of the eggs will be placed in the uncovered position and will be chilled. Allowing a female to set on more eggs than she can cover is one of the leading causes of poor hatches.Either remove and incubate the surplus eggs artificially or just dispose of the extras. Since the various breeds of ducks and geese differ a lot in size, it follows that the number of eggs which can be covered will also vary. How can I be certain that my bird is actually starting to incubate the eggs? The bird will normally begin to line the nest with her own down from her breast as she approaches the time when she will begin incubation. The down is a wonderful insulator. When she leaves the nest, she will usually cover the eggs with down, straw, and other material. When she actually begins to set (start the incubation period) she will be on the nest almost 24 hours per day. She will leave the nest for only brief periods once or twice a day to eat, drink and defacate. As the incubation period enters the 3rd and 4th week, she may well leave the eggs for more extended periods. She does this because she can- the animal heat from the eggs themselves is now strong enough to keep the eggs warm for a half hour or more, in warm weather especially. She may well sense that she needs to do this to avoid letting the eggs get overheated. Do not try to force her back on the nest. Let her instincts guide her. How long is the incubation period for domestic ducks and geese? Most geese from the European breeds will hatch in 28-30 days. The incubation period for the China usually hatched in 27-28 days for me. The Eygptian is a separate specie and their eggs can take 30-32 days to hatch. Ducks derived from the Mallard usually hatch in about 28 days. Bantam ducks often hatch a day earlier for some reason. Mandarins hatch in about 28 days. Muscovys hatch in the 33-35 day range. Keep in mind that exterior temperature and other factors may influence the incubation cycle so allow a day or two after the eggs should have hatched before tossing out "bad" eggs. Also, make sure that some eggs that are slow to hatch have not been abandoned when the female left the nest with her hatchlings. Are there things I should do for the female while the incubation period is going on? The most important things are 1) Keep other birds/animals from bothering her. 2) See to it that she has clean water and food handy when she comes off of the nest. 3) Candle the eggs after about 7 days to locate any infertlies and dead embryos and remove them. 4) Be sure that no other bird can use the nest to deposit their eggs. Such a situation creates numerous possible complications and problems. How do I know if an egg is infertile or if the embryo is dead? Use a flashlight with strong batteries. Eggs after one week should contain a small embryo with a large yolk sack attached; it may even be possible to see the beating heart in the 7-10 day period. Eggs which look pretty much as you would expect an "eating" egg to look are infertile. Those which contain embryos which are much smaller than the others and/or a "blood ring" contain dead embryos. 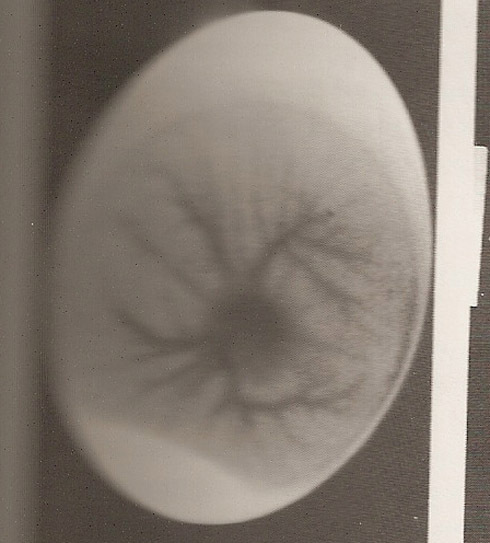 Gases build up inside eggs containing dead embryos and will frequently explode or leak. The bacteria thus released can affect the other eggs and may ruin a hatch. This is a fertile egg after about 10 days of incubation. Note how large and dark the yolk sack is. At this stage of incubation, movement of the embryo is easy to detect. How should hatching eggs be stored while I am waiting to set them? Eggs should be stored in a cool dry place in egg cartons large end up. Put a brick under one end of the egg carton and move the brick to the other end of the carton every other day or so. Eggs begin to lose hatchability gradually if stored for more than one week. Eggs which which lose too much moisture before they are set have a greatly diminished chance of hatching. I have purchased hatching eggs which are being shipped to me. How should I treat them upon arrival? Let the eggs "settle" for 24 hours before you set them. Check them carefully for hairline cracks before setting. Sometimes such cracks can be repaired with clear nail polish but watch those eggs carefully for signs of embryo death. Be aware that if the eggs were severely shaken or dropped during shipment, they may appear infertile even if there was fertility prior to shipment. It is the reason I will never sell eggs and the reason that many shippers of hatching eggs are reluctant to offer guarantees. Be sure to write down the date that incubation began for each setting bird so the hatch date can be calculated with some certainty. Do not trust your memory for it may fail you. Think ahead and plan for how the ducklings/goslings will be raised once they are hatched. Will the mother be allowed to raise them? Will you take them and raise them in a brooder? (See related article on rearing) If the mother is allowed to raise them, be sure than water containers are not deep and that the youngsters can climb out easily.